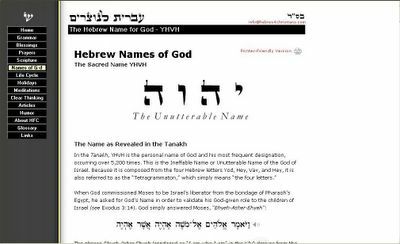 A good link on Esoteric Hebrew Names of God. You can listen to audio as well here. Hebrew is no doubt a beautiful language. What I find interesting is that in Torah it is acknowledged that, God is beyond names. Thats why God is sometime called Hasem (simply meaning, The Name, Lev. 24:16 ) or Adonai (My Lord) in Jewish Tradition. God Himself is Ein Sof - without End or limitation of any kind. God is always greater than our greatest thoughts about Him, even if we attempt to express His transcendence by means of the sacred letters of the Torah. In Himself, God is beyond all “predications” or attributes of language: He is the Source and Foundation of all possibility of utterance and thus is beyond all definite descriptions.